Everyone has compared the new iPhone 5S to the 5C, the Samsung Galaxy SIIII, and the nexus 4, but nobody has really compared it to Nokia’s Lumia 1020 Windows phone… until now. Both phones are rather beautiful in their own way. The Lumia 1020 is vibrant, boxy, and minimalist with a punch. The iPhone 5S is smooth, premium in look and feel, and designed to be as light and unobtrusive as possible. The Lumia 1020 is 14.5 millimeters thick at its widest point, and 5.6 ounces. The iPhone 5S is a consistant 7.6 milimeters thick, and 3.95 ounces. This is mostly due to the 1020’s massive camera sensor, but that’s a stunning difference. The iPhone 5S is 30% lighter, and 90% thinner than the 1020. It’s also got a much more consistent design, allowing it to easily sit flat on a table. The 1020 has a bulging design. For those wondering if the Lumia weighs more simply because of its larger display, I calculate that the 5S has an average weight of .35 ounces per square inch of screen real estate, while the 1020 weighed in at around .39 ounces per square inch, about 11% more. 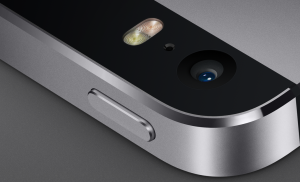 The iPhone 5S is expected to have a major advantage when it comes to speed. Apple’s new A7 processor is a quad core, 64 bit beast, with double the graphics performance of the previous iPhone, and with 2 GB of DDR3 RAM. The 1020 runs on a Snapdragon S4 processor, which is a dual core 32 bit processor. It also has 2 GB of RAM. In terms of wireless, both have 4G LTE cellular, but the iPhone 5S uses an updated wireless protocol that is expected to make wireless browsing over WiFi faster. Camera-wise, it’s a mixed bag. On the one hand, the Lumia 1020 has a 41 megapixel sensor, while the iPhone’s is a mere 8. This allows for massive crops, and high-resolution photos. The 1020 also has 6x zoom in-video, without loss in quality, once again thanks to its sensor, optical image stabilization, and it can also shoot at frame rates up to 1/16,000th of a second. Unfortunately, such a sensor has drawbacks. The 1020’s photo filesizes are massive, load times are slow, making it hard to get the right shot, and issues with white balance and lens-flare have been reported. The iPhone 5C, on the other hand, makes up for its small sensor size with a big punch of powerful features. Pixels have been enlarged and the aperture has been increased to f2.2 on the iPhone 5S, allowing for fantastic low light performance. A new, dual bulb flash, fairly uncommon until now in phones, provides more balanced light in super-dark areas. 120 FPS slow-motion HD video is now available, and every automatic feature, from white balance, to stabilization has been improved dramatically. 8 Megapixels is still fairly decent for a phone, and the image quality, above the pixel quantity, puts the iPhone 5S camera above that of the Lumia 1020. Read more about the iPhone 5S camera here. The Lumia 1020 has a 4.5 inch AMOLED 720P HD display, with 334 pixels per inch. The iPhone 5S has a 4 inch IPS display, with a pixel density of 326 ppi. Both are gorilla-glass protected. The Lumia has a slight edge here, with a larger, higher resolution display. It’s capable of playing HD video, unlike the iPhone. iOS 7 has a far greater number of apps that Windows Phone 8. It’s got more users, and higher-income users, so developers flock to it first. This means that most cutting edge apps start out on iOS, migrate to Android, but never quite make it to Windows Phone 8. This puts WP8, and the 1020, at a severe disadvantage. I’m leaving this category rather sparse, because this is subjective. Try out both operating systems, and decide which you like better. This varies. The iPhone has its notable fingerprint scanner, which should make for a whole host of new online and mobile payment systems. The Lumia 1020 has a massive 41MP sensor with optics from the famed German lens manufacturer, Carl Zeiss. I’m a bit biased, considering my history of phone purchases, but I’d say the iPhone 5S is the clear winner. While the Nokia Lumia 1020 has a giant camera sensor, and a vibrant, large screen, it’s also bulky, with an underwhelming camera in reality, and rather old specs. It’s also running on an operating system with far less choice of applications, which puts it at a major disadvantage.